It’s early. Sitting in bed watching the sunrise roll across the hills, lighting each field and fold in turn. A million-dollar view ….. no, beyond price. Coffee on the patio, out of the sun but warm and bright. The morning walk around the edge of the village. Stunning views across the miles of trees, herbs and plants that provide food for the bees to flavour the extraordinary range of honeys produced locally. Colmena – beehive – how the town was named. Colmenar – the beehive of the Axarquía region, benefitting from the miracle of worker bees. Back through a little alley to my second-favourite panadería for freshly-baked bread. Today’s breakfast is the new loaf topped with Miel de Milflores – thousand-flower honey. A smooth, light flavour, not as strong as my last jar of Miel de Aguacate (from the blossom of the avocado tree) which boasted extensive health-giving properties (something to do with boosting my iron, I vaguely recall) but was overly-strong for my taste. Plenty to choose from though, as between the bakery and my house is El Museo de la Miel, the Museum of Honey. Not a museum in the usual sense, but a fascinating centre dedicated to demonstrating all aspects of honey production, with a shop offering try-before-you-buy of the eight or more flavours produced. I must pick up the leaflet which explains which honey should be used for which ailment. Eating thousand-flower honey in my little dead-end cobbled street, named Rincón de las Flores – the flower corner, or flowery nook. There’s a theme emerging, but it can’t be taken much further as I’m not good with gardens and would not be assiduous enough at watering for needy flowers to survive the Andalucian sun. 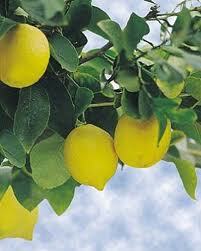 But today I bought a lemon tree, and have drenched it in water. I chose one with lots of new growth, hoping the young pale leaves indicate that it is happy and healthy. Tomorrow I will buy una maceta, a big ceramic pot, from Antonio’s amazing selection underneath the Hotel Arco Del Sol, and I will plant it in my mother’s memory. She gave me the push I needed to come here and buy this house, and she will always be here with me as I do my best to nurture her lemon tree. We had five or six fantastic holidays in Italy in the 1980s and 90s, and on one we travelled right down to the southern “toe” end of the country to stay on a Calabrian farm in rural countryside not dissimilar to the Axarquía. I will always remember mum’s childlike delight on discovering she could reach through our bedroom window and pluck a sweet-smelling lemon straight from the tree, hot to the touch from the strength of the sun. If my tree – her tree – grows big enough to bear fruit, I shall try to capture and never to lose that same delight in the miracle that is a freshly-picked, sun-kissed lemon. This entry was posted in Spain and tagged Andalucia, Colmenar, Spain, SpanishBlog, Tamara Essex by tamaraessex. Bookmark the permalink. Sounds likea perfect morning trip, yesterday i made a lemon cake which is amazing and sweet and tart all at the same time. I ran out of lemons and so asked my son who called in for something , i can’t recall what , to go and pick one from the tree. We had our first warm day for ages and when he came back with said lemon it was all warm and sun baked and was exuding an amazing aroma so i soooo know what that warm lemon straight off the tree is like. Enjoy your sunny summer days in your new corner of the world. Hope to see you in Sept.
Aaaaah, and I could feel it as you describe it, too! Yes I hope we overlap in Dorset, I’ll liaise with Joe about dates.